The Comic Strip Presents...BAD NEWS! The Comic Strip Presents... BAD NEWS! Four hairy muisos with a dream to be the next Motorhead. Sure they have musical differences – all great bands do. But with Colin's PA ,Vim's old transit van and the entire back line stacked on HP, what could possibly go wrong ?…. Chart success, adoring fans and excess all areas, it can only be GOOD News surely! Then the unexpected happens. BAD NEWS get picked by Channel 4 television for a fly on the wall documentary about a metal band's quest to make the big time. 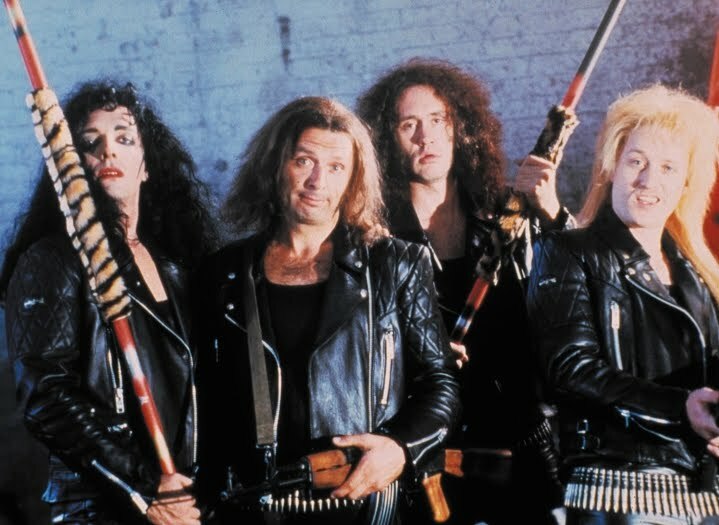 The film when first broadcast caused immediate outrage not just with metal fans who thought it was “far too heavy”, but the band got condemned by the music press who declared them: “the worst thing since Shawaddywaddy” or as one smart arse critic wrote “this isn't Metal, it's Heavy Lead”. The documentary ends with the band in a sprawling fist fight and falling apart as they head for obscurity. That riveting film of BAD NEWS is what you actually have now in your grubby weed stained fingers …yeah? But it wasn't all bad news. . Sharkey Mcyntyre the scrap dealer turned pop promoter using the old dictum that “there's no such thing as bad news” immediately invited the band to play at the Monsters of Rock festival at Castle Donnington along with some of their heroes including Motorhead. Suddenly there's a part two of the Bad News story and when EMI decide to sign the band. Channel 4 also embark on a second film MORE BAD NEWS (even longer than the first!) 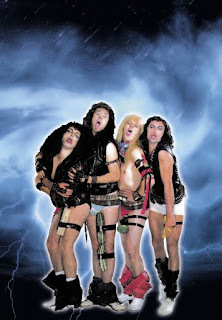 charting their rise to fame as they record two albums with the legendary axe man Brian May who actually lets them murder the Queen classic “Bohemian Rhapsody” - it's all laid out here in front of you – followed by a national tour ending with a final live concert at Hammersmith Odeon (also included). SO! You got your BAD NEWS t-shirt and patch, your picture filled tour programme - Now get yourself a greasy hot dog a plastic pint of lager; roll yourself a huge spliff and sit back and enjoy…. Are you ready?! Coz here they come! “The worst band in the world” On Film! On CD! On Bootleg! And live here on stage Ladies and Gentlemen!